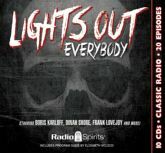 Radio's premier showcase for heart-stopping horror is presented in this collection of twenty great episodes of Lights Out! Produced, written, and directed by broadcasting legend Arch Oboler - and starring Boris Karloff, Mercedes McCambridge, Dinah Shore, Gloria Blondell, and more - these tales are devilishly devised to keep you up all night! Radio, more than any other medium of popular entertainment, is an ideal vehicle for dark tales of dark deeds. Perhaps that's because the greatest fears in the back of our minds are the terrors we can't see�the murky musings made all the more horrific by the fact that we can never stare them in the eye. Includes twenty digitally remastered and restored episodes and a Program Guide by radio historian Elizabeth McLeod!